Let’s examine the above quote. The first paragraph might suggest that conductor loss is insignificant and dielectric loss might be significant at VHF and UHF. It also seems to assume that standing wave ratio is small, whereas that is not the case in general, these types of line are often / mostly used with extreme VSWR. Under extreme VSWR, some sections of the line may carry relatively high current. Taking Wireman 553 (W553), a ‘premium’ grade windows ladder line, as an example. (Stewart 1999) characterised W553 using a series of measurements from 50-150MHz.That work has been incorporated into many line loss calculators and graphs, but few warn of the risk of extrapolation outside the measured range. Above is one of the many graphs used, but I have shaded in green the safe area, the area that is not an extrapolation or projection but an interpolation based on measurements. When you buy lines based on such extrapolations, you may be on unsafe ground. 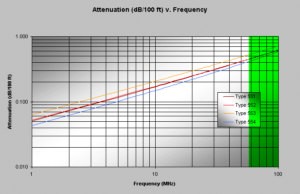 Let us deconstruct Stewart’s measurements into conductor and dielectric loss. Above is a graph that includes the measured range (shaded green) and extrapolation above and below the measured range assuming copper conductors with well developed skin effect. 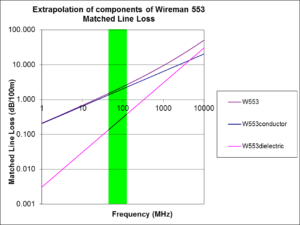 The first conclusion that can be drawn is that within the green range, losses at VHF are predominantly conductor loss, dielectric loss is much lower. 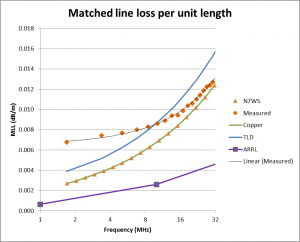 Extrapolation of conductor loss to HF is not so safe, as the conductors are not copper, but copper clad steel with very thin copper cladding that is unlikely to deliver copper like performance over HF. 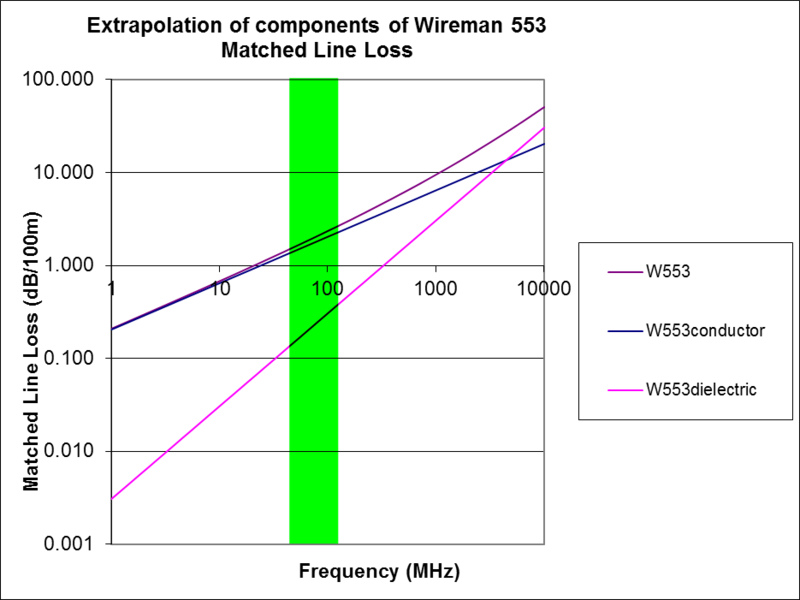 Loss of Wireman 553 windowed ladder line at MF/HF reported KN5L’s measurements. loss from ARRL Antenna Book 21. 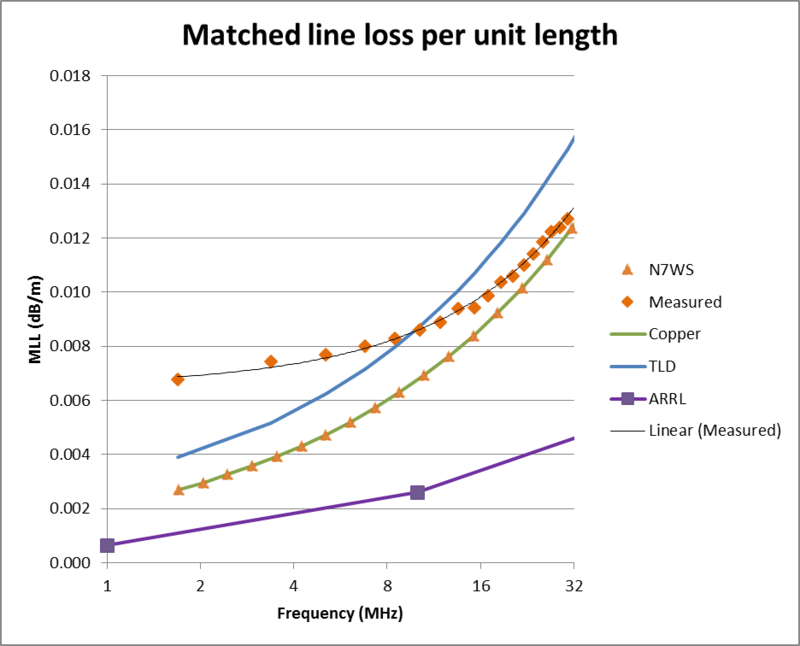 It can be seen that below 32MHz, the measured values diverge from the copper and N7WS curves which hints that the assumption of the N7WS and copper models of fully developed skin effect becomes invalid below 30MHz for this line with error increasing as frequency decreases. there is no shortage of online experts who can’t wait to devalue well considered postings… it is the way of online forums. Stewart, W (N7WS). Mar 1999. Balanced Transmission Lines in Current Amateur Practice.